RTS fans, take heart, there are still a few devs out there who haven't forgotten us. Elder Games is working on a sequel to 2014's Meridian: New World. Meridian: Squad 22 hits Early Access May 30. It's solid sci-fi fare: Earth's first batch of colonists have gone missing, so an elite group of soldiers are dispatched to find out what's going on. This being an RTS, I'm doubtful that the colonists have made peaceful first contact. Even in its early stage, Squad 22 sounds like a considerable improvement over its predecessor. You can zoom and rotate for one thing. More impressively, models and textures are brand new, pathfinding ought to have been improved no end, with units now accelerating and decelerating based on their proximity to others, and naval combat has been introduced. Regarding Early Access, Elder Games is planning to keep things snappy. In terms of units and technology, Squad 22 is reportedly close to completion, so Early Access is pegged to be a 10-week feedback and bug-squashing period. What do you think? Worth a punt? 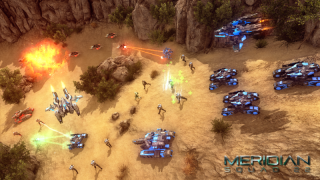 If news of Meridian has left you curious about the state of the RTS at large, we dug into the detail of why so few big names are willing to invest in the genre.